The illume LED plastic pucks can be recessed or surface mounted in any direction. These pucks features a frosted lens and deliver highly efficient punches of white light for many applications and particularly kitchens. Ideal for inside accent lighting, you'll find many uses for them, under or over any cabinet, counter, shelf or display. Its very low profile makes it very easy to hide even in shallow structures. Up to 4 pucks on can be installad on this driver. Imagine being able to control your lights from your cellphone or tablet. Turn them ON/OFF, create a unique ambiance at the touch of a button. This is exactly what you will accomplish with the WI-FI RGBW tape kit. Choose from the RGB color range or 4000K soft white. An excellent choice for a variety of applications such as bedrooms, kitchens and workspaces. Iphone and Android compatible. 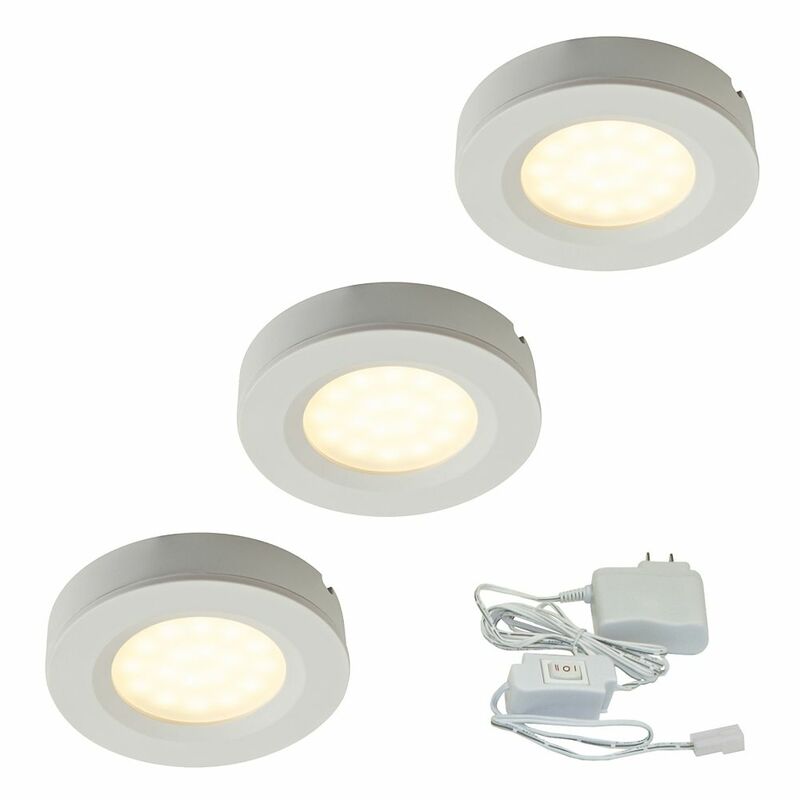 2.75-inch White Plastic LED Puck Kit (3-Pack) The illume LED plastic pucks can be recessed or surface mounted in any direction. These pucks features a frosted lens and deliver highly efficient punches of white light for many applications and particularly kitchens. Ideal for inside accent lighting, you'll find many uses for them, under or over any cabinet, counter, shelf or display. Its very low profile makes it very easy to hide even in shallow structures. Up to 4 pucks on can be installad on this driver. 2.75-inch White Plastic LED Puck Kit (3-Pack) is rated 4.0 out of 5 by 3. Rated 2 out of 5 by RobB from Good product, but LED life is too short I installed three sets of these lights along with junction boxes under my kitchen cabinets about one and a half years ago. I was happy with the product until recently, when one of the lights stopped working and two started flickering when turned on. LED lights are supposed to last a long time, but that does not appear to be the case for these lights. Rated 5 out of 5 by Ducatista10 from Excellent LED Pucks Purchased a couple packs of these last week in store and wired them up using one of the direct wire illume LED drivers (12W). I could not be happier with the result. The driver was great and the pucks provide the perfect amount of light. Will definitely purchase more of these in the future. Easy installation as well. I used the provided bracket to surface mount my pucks, I did not countersink them to flush mount with a whole saw but that is possible with these lights as well and looks to be very easy if you have the right sized whole saw. Rated 5 out of 5 by GirlWithTools from I am so glad I discovered this product! These pucks are incredibly easy to install, I purchased the set for the area around my sink, within a few minutes I was able to mount it under the cupboards. Later today I'll be back at HomeDepot to purchase a second set for the kitchen area besides the stove, it is going to replace the old light bar. The set seems to do the trick for me, it came with all necessary wires/connectors and the LED adapter, including a switch for HIGH/off/LOW and 6 screws for attaching the pucks. And it looks great! Are these puck lights dimmable with a seperate driver? @Thank You for choosing Illume. Yes they are; using our 12w dimmable driver ( I-BTDIMLED12).